Lana: What should we do tonight? Betty: Let’s just stay home. I don’t want to get dressed up to go out. Lana: That sounds so boring! Let’s go to the new club that everyone at school is talking about. Betty: I don’t know… I’m already sleepy and if we go out, we’ll be out pretty late. Lana: Come on! It’ll be so fun! Since it’s spring break, I bet there will be lots of cute guys there from out of town! You know you want to! Betty: OK, OK! You’ve twisted my arm. Let’s start getting ready. What should I wear….? GF: So… my cousin is having a party on Saturday. It should be really fun. It would also be a good chance to meet some of my family. BF: Oh, really? Hmm, I’m not sure if I have to work this weekend or not. GF: But you never have to work on Saturday nights. This week is different? BF: Uh, yeah. I think so. I have to check my schedule. GF: You know what I think? I think you’re lying to me about having to work; you’re just not interested in meeting my family. I don’t want to have to twist your arm if you don’t want to go. I want you to come with me only if you really want to. Just tell me the truth and I’ll try to understand. Lying isn’t going to help our relationship, you know. BF: I’m sorry, you’re right. I’m really nervous to meet your family. Please just give me more time. GF: Okay, that’s all you have to say! 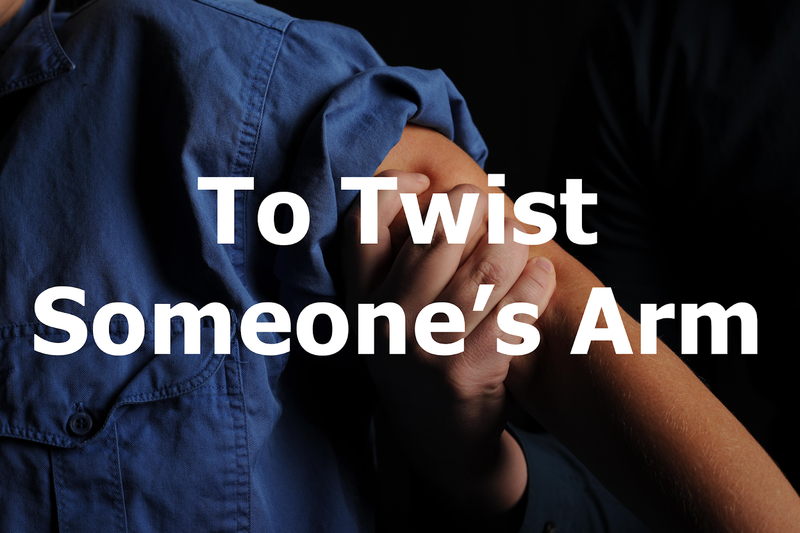 To twist someone’s arm means to work to convince someone to do something they might not want to do. Sometimes it’s used similarly to force. Please note: people are not actually twisting someone’s arm physically! In example 1, the friends are discussing their plans. Betty doesn’t really want to go out, but Lena convinces her by reminding her that she can meet cute guys at the club. In example 2, the girlfriend is almost angry in feeling that she has to force her boyfriend to go to a family party with her. You’ll have to twist my arm to see that movie! I really don’t like the actress. Johnny didn’t want to come to the baby shower. I had to twist his arm. Let’s get some ice cream! … Great idea! You don’t have to twist my arm!